This large knitting gauge enables you to tell the size of your needles by simply inserting them into the holes. 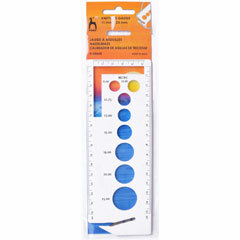 Includes a ruler in both centimetres and inches to help with sample measuring. Plastic. Sizes 11mmm to 25mm.